Distribution: Found in Canada from Nova Scotia west to Saskatchewan. In the US, it occurs from New England west to North Dakota, Nebraska and Eastern Colorado. 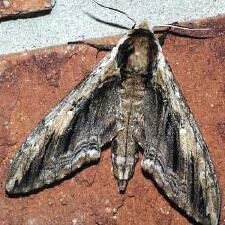 It is less common in the south, but can be found from Florida to eastern Texas. and Size: One brood in the north from May-Oct, two broods in the south. Wingspan 88 - 115 mm. 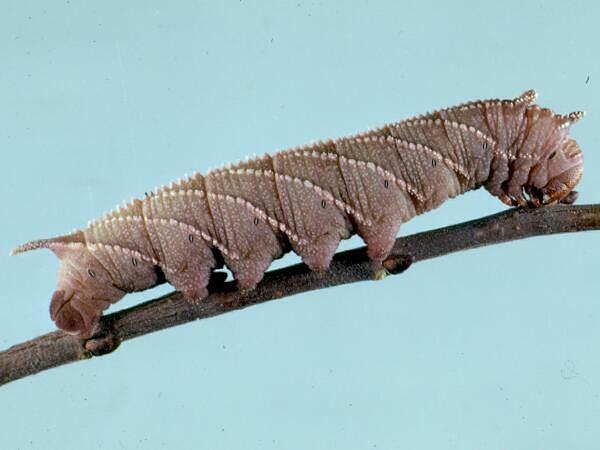 Host Plants: Larva is brown or green, with spinulose horns on the thorax, in addition to the horn at the end of the abdomen, leading to its alternate common name of Four-horned Sphinx. Much of the body is covered with white granules and a ridge of scalelike plates runs down the dorsal midline. The food plants are elm, basswood, and birch. brown thorax with wide darker brown stripes towards the edges. 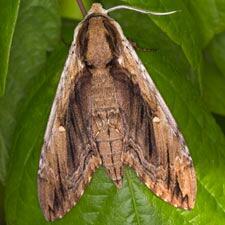 forewing light brown with whitish pm. 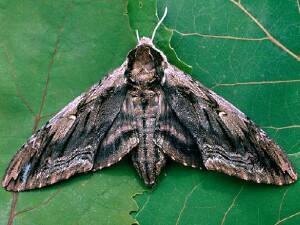 line, dark streaks along veins, white tint along the costa and whitish reniform spot. hindwing brown with a dark brown border and incomplete lines. 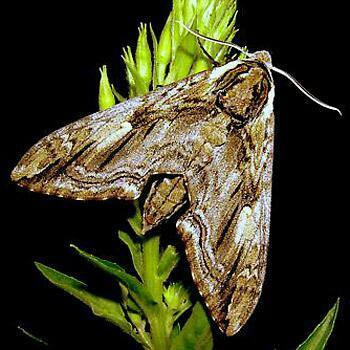 C. hageni: pattern overlaid with green, pale gray patches at tip of forewing and mid-costa. Found only in Kansas, Arkansas, Missouri, Mississippi and Texas. 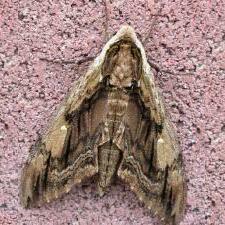 C. sonorensis: found in southern Arizona, 3 black dashes on forewing. 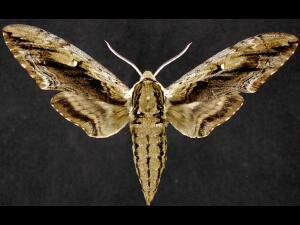 C. undulosa (Waved Sphinx): reniform spot large, white with black outline. 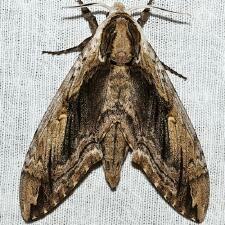 C. catalpae (Catalpa Sphinx): yellowish brown with relatively indistinct lines on forewing. Reniform spot black with gray filling. Bill Oehlke's species page for Ceratomia amyntor. Covell Field Guide p.33; Pl. 3(9, male). Tuttle, J. P., 2007. 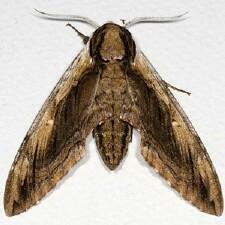 Hawk Moths of North America: p. 63; pl. 9.8. Wagner, D. L., (2005). 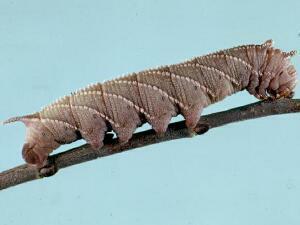 Caterpillars of Eastern North America, p. 250. © Janice Stiefel - m.